I want to talk more about what I think the prevailing influences are on the “art comics” being made today. This conversation should have begun with Gary Panter. Sure, I know there is the undeniable influence of Jack Kirby (most creators read superhero comics at some point), Robert Crumb, maybe Dave Sim, Moebius, Art Spiegelman, etc. But all the influence is of all these guys has been so abstracted. The one that is less adulterated is Panter. His work is so diverse and extensive, that it certainly serves as an example of why these brief history posts are unfairly reductive. Nevertheless, the guy who create Jimbo and won an Emmy for Pee-Wee’s Playhouse title sequence is the best entry point for understanding much of today’s comics avant garde. In 1980, Panter wroter the “Rozz-Tox Manifesto.” Read it here. This document explained Panter’s idea of artists (particularly in America) admitting that they worked within a capitalist system and using this as a means to reach a larger audience (or market) rather than seeing it as an artistic straight-jacket. Whether this manifesto is a document of hope or immense self-delusion, the methods described seem to have served Panter well – he has earned a living off of his work for over thirty years, and never, in my opinion, does it show signs of compromise for market. Panter’s old L.A. buddy Matt Groening says this his work is inspired by Rozz Tox – seems to have worked out for him. than those who came before him and worked a little further up the California coast. Panter’s work is executed in a rough, punk, style, using lots of pens, think paints, bright colors, and bold sketchiness. 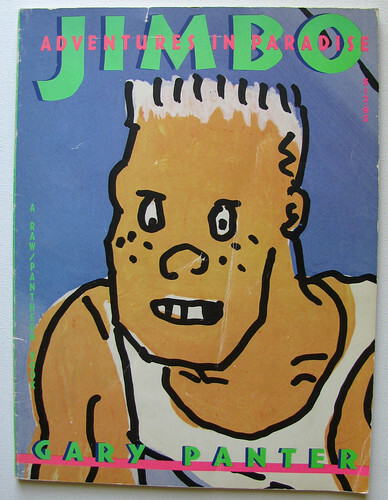 His work often features a thuggish punk icon, Jimbo, who Panter has even employed in an exploration of Dante’s Divine Comedy with his books, published in fancy art edition, Jimbo in Purgatory and Jimbo’s Inferno. Panter’s influence can be seen clearly in the work of the Fort Thunder artists who we discussed recently, as well as in the compositions of Frank Santoro, and the ambitious explorations of Dash Shaw, some of whom Panter has played a mentor to.